The Mornington Peninsula is situated only 98 km south of Melbourne (Sorrento being the tip of the Peninsula). Another way to arrive to the Peninsula is by ferry. We wanted to avoid the city a few years ago, and we planned to follow the coastline all the way to Sydney. Coming from the Great Ocean Road we followed the signs after Torquay to Barwon Heads and Queenscliff. This is the Bellarine Peninsula, on the south west tip of Port Phillip Bay. If you’re lucky enough, dolphins follow the ferry while crossing the entrance of the Bay. We arrived at Sorrento, which is just a short drive away from the first of many national and s tate parks one can find on this tiny piece of Australia. 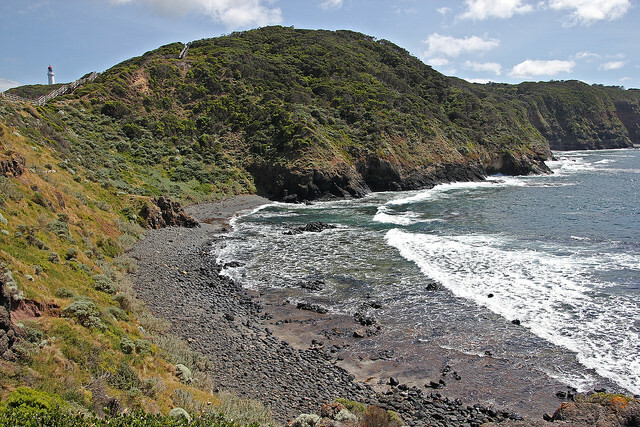 The Mornington Peninsula National Park basically follows the coastline. The other road to access the NP, is from Rosebud (C777). This road brings you straight to Cape Schanck Lighthouse Reserve. A beautiful lighthouse, constructed in the mid – 1800’s (entry fees apply). But nature is even more beautiful. The park management has done an excellent job with a boardwalk taking you down to Cape Schanck. We kept following Road C777, and went around Western Port to reach the other side. Another option would be to take a ferry and cross French Island (almost completely national park) or Phillip Island (Penguin Parade). The Peninsula is not only a ‘beach and ocean place to be’, but it is also home to numerous vineyards and orchards. Be there in the right season and you can enjoy the sun, the beach, some good drinks and lovely food!